They claim that this is what happens after a director has so many films; he becomes full of himself and creates a long, slow, pretentious letdown. None of those things are true. I’m going to skip even a brief overview of the story so feel free to read with no spoilers. This movie is as amazing as we hoped it would be and is the near perfect finish to a trilogy I’m glad this decade can claim as it’s own. Too often we’ve been cluttered with unnecessary sequels and reboots, only helping smear the names of it’s predecessors (the Star Wars prequels for instance) or have been given a strong start, and a weak ending. Director Christopher Nolan has not only given us a trilogy to wipe clean the slate of the 1990’s films, but has completed what could easily be called his masterpiece. It is still possible to favor The Dark Knight over Rises, don’t get me wrong. Heath Ledger’s role as the Joker opened film up to something familiarly evil while bringing in a new kind of attitude about it. His passing also placed the interest of the movie higher than that of any previous Batman film before it and his portrayal of the madman clown has already gone down as one of the greatest movie antagonists of all time. Yet how our new rogue entertains an entirely different feel to villainy while effortlessly taking his place among the best of Batman’s rivals. Tom Hardy (Inception, 2010, Warrior, 2011) gives us a performance as the villain Bane; a step in a new and needed direction. His goal similar to his chaotic precursors, his methods falling in line with Joker’s ferocity, yet Liam Neeson’s direction. While Joker might have a cut a face up, Bane may break your neck with his bare hands. Or whatever other part of your body he can get his hands on. Which is worse is up to you. I specifically want to mention Hardy as Bane in an effort to say that while we’re not getting the same villain we did in Dark Knight, why would we want that? It feels as though Nolan, Hardy and co. have taken time to perfect a character that is his own and not a copy or an attempt to recreate any of the previous bad guys. Certainly not the 1997’s Batman & Robin incarnation of Bane, which left him as simply a grunting idiot, but rather calculating and brutal, ready to take the life on any who oppose him as well as some that support him. To praise Hardy isn’t to leave out any others as well. Every single actor of this amazing cast performs to the best of their ability and with the best possible results. Hathaway’s Catwoman is every bit the parallel to Batman you want her to be; with shady intentions and a finesse in her fighting that our title character can’t match. Gary Oldman’s return as Commissioner Gordon is amazing, as it has been the past films. Even lying in a hospital bed, his talents are far from lacking. Nothing could have been better in his depiction of a good man living out a lie. Joseph Gordon-Levitt seems to be make no wrong choices in his films these days and this is by far the most enjoyable. Yet for all that can be said of the entire cast (I really hate skipping over anybody or even just brushing on them like I did. Marion Cottilard is also great), Michael Caine’s return as Alfred Pennyworth, Bruce Wayne’s loyal butler and family friend, performs to a new height in acting. Burdened by the secrets he keeps from his friend and employer, weighed down by the things Bruce has done, Caine lets loose what is surely one of the greatest enactments of his career, much less someone else’s. He is only complimented by Bale’s third return as Wayne; a broken and near bitter man. He’s wiser by far but by no means content with the years that have gone by since the events of Dark Knight. A life like the one he led could have only turned out the way it has when we first see him again: lonely and apathetic. Bale seems to understand the character like Nolan understands the grand scope of it all. 2006’s Superman Returns was like a cake that was so greatly decorated, no one wanted to eat it until it just went bad; while Nolan has taken comics and movies and crossed them like no filmmaker before. Much like Iron Man to Dark Knight in 2008, Avengers is the same to Dark Knight Rises: a fun film to an epic. Marvel may have the quantity in film but thanks to The Dark Knight Trilogy alone, DC has the quality. This makes me actually look forward to the Man of Steel to be released next year, Nolan producing. Final note: A perfect ending to a great franchise. Watch it and examine the themes, or watch it and just be entertained, I’m happy this was made, and while I hate we won’t see these films anymore, this isn’t a sad ending. I’m glad Nolan is done. He’s had a great run that has yet to be tarnished and Batman’s name in film is finally clear. 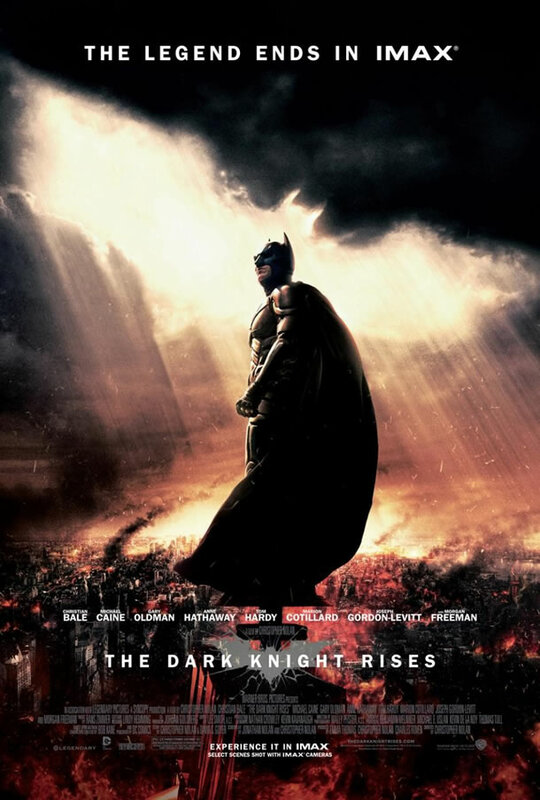 This entry was posted on 07/20/2012 at 1:29 am and is filed under Reviews!, The Dark Knight Rises Stuff with tags anne hathaway, batman, christian bale, christopher nolan, review, the dark knight rises. You can follow any responses to this entry through the RSS 2.0 feed. You can leave a response, or trackback from your own site.